How is sustainability applied in a practical, meaningful way? How can sustainability be integrated into an organization’s culture and daily operations? What is sustainability? How is sustainability applied in a practical, meaningful way? How can sustainability be integrated into an organization’s culture and daily operations? Understanding and exploring the answers to these questions is an important step to successfully implementing sustainability principles. Every sustainability effort is unique and, often, organizations will adopt varying definitions of what sustainability means to them. 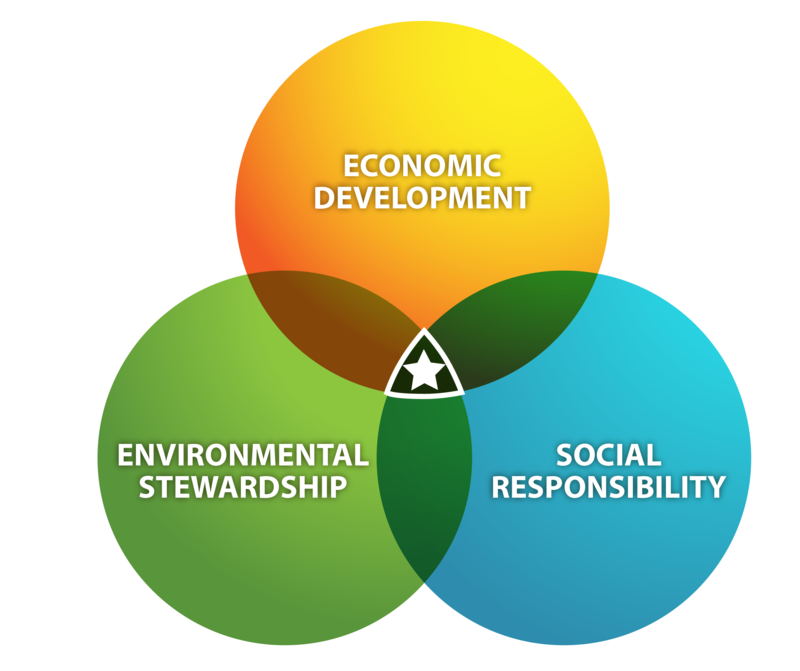 Generally speaking, most definitions of sustainability are founded in the principles set forth in the Triple Bottom Line (environmental stewardship, economic growth and social responsibility). 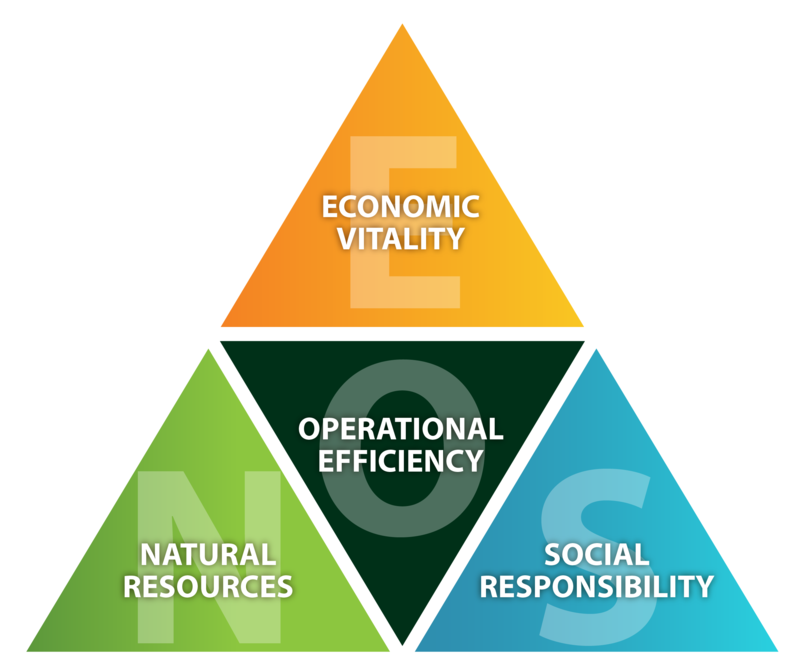 The airport industry, in particular, has adopted the “EONS” approach to sustainability (economic vitality, operational efficiency, natural resources, social responsibility), which expands the concept of the Triple Bottom Line by emphasizing operational efficiency. Applying the Triple Bottom Line and EONS means that we measure our success not only by the traditional financial bottom line, but also by our achievements in stimulating economic growth, protecting the environment and our natural resources, being good corporate citizens, and efficiently operating our facilities. Sustainable solutions strive for excellence in all areas of the Triple Bottom Line and EONS. Many airports find that they already have existing activities or programs that fall within the sustainability realm, even if they do not have a formal sustainability program. Examples include “Buy Local”, “Recycling”, or “Stockpile and Reuse Construction Materials”. These are common-sense activities that fall under the umbrella of sustainability. Identifying a definition of sustainability can be an important first step in starting or enhancing a sustainability program. Share what sustainability means to you and your organization. How are sustainability principles applied in a practical, meaningful way? Airports and organizations around the world have successfully implemented sustainability programs without creating a financial burden or causing disruption in operations. Along with benefiting their communities and the environment, airports are finding that sustainability makes good business sense. Airports that have adopted sustainable practices have found substantial benefits including reduced capital asset life cycle costs, reduced operating costs, better customer service and satisfaction, and enhanced relationships with their neighbors. Connecting sustainability to other goals within the airport is critical to developing a successful program. In many cases, sustainability efforts begin by finding initiatives that save money while stimulating economic growth, protecting the environment, and improving social responsibility. In addition, sustainability is a useful tool to engage stakeholders, create partnerships, improve customer satisfaction, and draw business to the airport. Creating short-term successes through sustainability and showcasing those achievements helps to build support for future sustainability efforts. 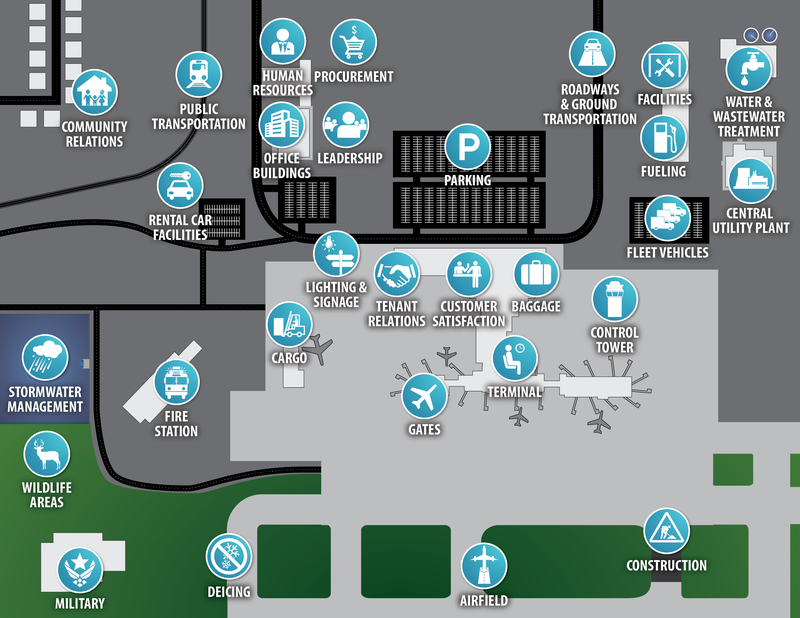 Click on the blue icons on the map below to see a list of initiatives that are applicable to that location and function. The figure below highlights some practices that have been successful at airports around the world. These practices are examples of ways to integrate sustainability into the airport’s operations. This map is also located on the SUSTAINABLE PRACTICES page to improve search results.